The Mediterranean fruit fly is a short, squat fly about 1/4 inch in length (Fig. 1). It has a blackish thorax marked with silver; a tan abdomen with darker stripes extending across the abdomen; and clear wings with two light brown bands across the wing, another along the distal front edge, and gray flecks scattered near the base. The immature stages are superficially similar to those of other exotic fruit flies (Fig. 2). Eggs are white, very small, elongate, and somewhat banana-shaped. Larvae are white, legless, and somewhat carrot-shaped. The pupa is contained inside an elongate oval, shiny brown, hard puparium. The Mediterranean fruit fly is native to Africa, but has spread to other parts of the world including southern Europe, Australia, and the New World tropics. In Africa, it has been recorded from Algeria, Angola, Benin, Botswana, Burkina Faso, Burundi, Cameroon, Congo, Egypt, Ethiopia, Gabon, Ghana, Guinea, Ivory Coast, Kenya, Liberia, Libya, Malawi, Mali, Morocco, Mozambique, Niger, Nigeria, Senegal, Sierra Leone, South Africa, Sudan, Tanzania, Togo, Tunisia, Uganda, Zaire, and Zimbabwe. In Europe it is known to be established in Albania, Croatia, Cyprus, France, Greece, Italy, Malta, Portugal, Slovenia, Spain, Switzerland, and Ukraine. It has invaded and become established in the Atlantic Ocean islands of the Azores, Canary Islands, Cape Verde Islands, Madeira, St. Helena, and S�o Tom� and Principe. It is known from the Middle Eastern countries of Israel, Jordan, Lebanon, Saudi Arabia, Syria, and Turkey. It is established on the Indian Ocean islands of Madagascar, Mauritius, R�union and Seychelles. It has been recorded from the Caribbean on the island of Jamaica and in the Netherlands Antilles. In the Pacific it is established in western Australia, Hawaii, and the Mariana Islands. In the Americas it is known from the Central American countries of Costa Rica, El Salvador, Guatemala, Nicaragua, and Panama. Finally, it is established in the South American countries of Argentina, Bolivia, Brazil, Chile, Colombia, Ecuador, Paraguay, Peru, Suriname, Uruguay, and Venezuela. This pest was first trapped in California in 1975. Development is temperature dependent. 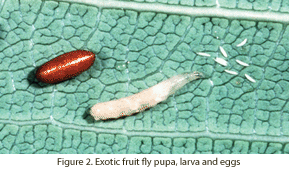 Eggs of the Mediterranean fruit fly are laid below the skin of the host fruit. They hatch within 2-4 days (up to 16-18 days in cool weather) and the larvae feed for another 6-11 days. The larvae leave the fruit and pupate in the soil under the host plant, and adults emerge after 6-11 days. Adults can live for up to 2 months. The total time from egg to adult can vary from 5 weeks to 5 months, depending on temperature. Tropical fruit flies represent a major threat to California�s agriculture. The damage caused by larval feeding makes fruit unfit for human consumption. In addition, the presence of an established population would cause a severe economic impact via restrictions/prohibitions on the export of fresh fruit both domestically and internationally. The crops potentially affected in California are many and comprise a significant portion of the total agricultural output for the state. 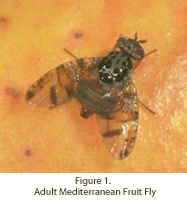 The Mediterranean fruit fly has one of the widest host range of any pest fruit fly, and is considered the most important agricultural pest in the world. It has been recorded infesting over 250 cultivated and wild fruits. The host list includes apple, apricot, avocado, bell pepper, carambola, coffee, dates, fig, grape, grapefruit, guava, lemon, lime, loquat, lychee, mango, nectarine, orange, papaya, peach, pear, persimmon, plum, pomegranate, pummelo, quince, sapote, tangerine, tomato, and walnut. In California, the combined 2011 gross value of the above hosts was over $16.5 billion (USDA NASS 2012).